That does look rather like heavy congestion either on the cabinet or the exchange. 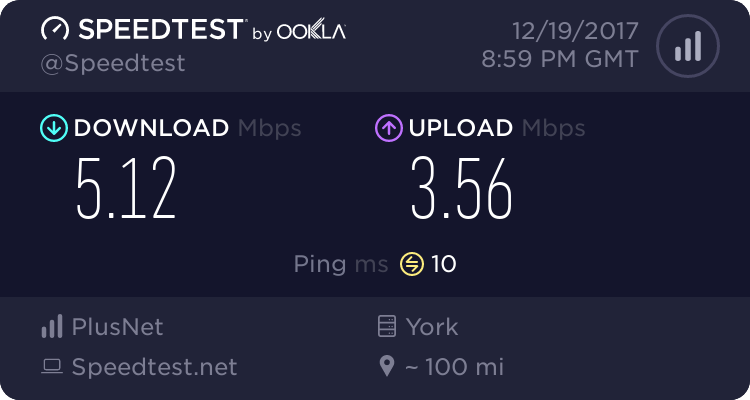 The last few days I've been getting very strange results from the speed test on here, but trying several other speed tests and these seem about what I would expect. Not changed speed test software. No sign of congestion on links to and from us. http://tbb.st/1513527990715671055 is bad, the low number of points can be a symptom of high CPU load, or browser issues, or your PC is download or uploading something in the background causing issues. todays speed test is on a different ip address as had master socket to bits this morning during testing as plusnet line test came up with a problem. There are quite a few not recorded in my profile as I wasn't logged in. It may be due to other traffic, but if I get one bad result I usually check for other traffic and try again, in this case I did a speed check as things where running slow, I then realised gf's laptop was updating, I then waited till this had finished before running further speed checks.